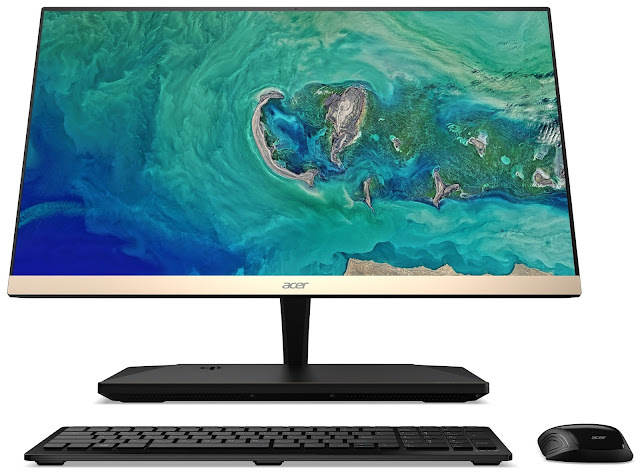 Acer expanded its iconic Aspire desktop series with the announcement of the new 23.8-inch Aspire S24 all-in-one desktop PC. Designed with elegance in mind and running Windows 10, the ultra-slim Aspire S24 is the perfect device for the modern consumer looking for both style and ability. The new all-in-one desktop is Acer’s slimmest ever, featuring a display with a side profile of only 5.97 mm. The borderless display and black and matte gold color scheme ensure that the device will become a focal point of any home, adding a touch of functional elegance and luxury. Built with a dual focus on design and premium functionality, the Aspire S24 delivers a vivid and crisp viewing experience from all angles with its 178-degree Full HD IPS screen, while its ultra-narrow 2.7 mm bezel provides a 90% screen-to-body ratio for more screen to see. All-new 8th Generation Intel® Core™ processors with optional Intel Optane™ memory enables the Aspire S24 to power through immersive entertainment and everyday tasks with ease, while delivering a smooth and responsive computing experience. Wireless connectivity powered by Intel® Dual Band Wireless-AC (802.11ac 2x2 MIMO) technology provides fast and reliable network connections, and thanks to the 2.1 channel subwoofer coupled with Dolby Audio™ Premium and Acer TrueHarmony™ technology the desktop provides users with a powerfully-deep base audio experience bringing even the most subtle sounds in music and video to life. The Aspire S24 provides new levels of functionality through Windows 10, featuring Cortana and Microsoft Edge. The wireless charging base allows users to seamlessly power their mobile device, supporting wireless charging for Qi-enabled devices, without the burden of cables. Ergonomically designed to maximize productivity by reducing operator fatigue and discomfort, the Aspire S24-880 features a -5 to 30 degree tiltable display combined with Acer ExaColor™ technology for accurate colors, and BluelightShield™ and Flickerless™ technologies that may help prevent eye fatigue. The Aspire S24 comes with up to 256 GB SSD and 2TB HDD of storage space, making it the perfect device for editing and storing large video projects. The Acer Aspire S24 will not be available in South Africa. The Aspire S24 was unveiled at the next@acer press event at IFA 2017 in Germany, where the company announced a range of new devices and solutions. For more information, visit www.acer.com.